Many physicists are not aware of the fact that they can solve their problems by applying optimization algorithms. Since the number of such algorithms is steadily increasing, many new algorithms have not been presented comprehensively until now. 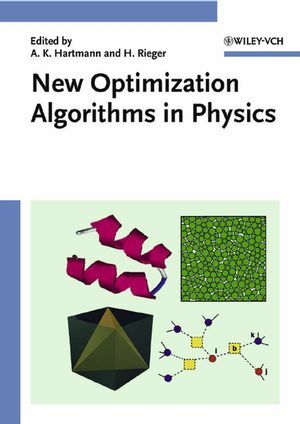 This presentation of recently developed algorithms applied in physics, including demonstrations of how they work and related results, aims to encourage their application, and as such the algorithms selected cover concepts and methods from statistical physics to optimization problems emerging in theoretical computer science. Alexander Hartmann studied computer science and physics at the universities of Hagen, Duisburg and Heidelberg, Germany. After receiving his PhD in 1998, he went as a postdoc first to the University of Göttingen, Germany, then to the University of California at Santa Cruz and the Ecole Normale Superieure, France. In 2002, he returned to the University of Göttingen, where he is currently heading a junior research group. His research interests comprise computer simulations, disordered magnetic systems, surface physics, combinatorial optimization and bioinformatics. Heiko Rieger received his PhD in theoretical physics in 1989 at the Universität zu Köln, Germany. From 1990 to 1992, he worked as a postdoc at the University of Maryland at College Park and at the University of California at Santa Cruz. In 1994, he got his habilitation in theoretical physics and was a Heisenberg fellow from 1996 to 1999, working at the Forschungszentrum Jülich. He started teaching as a professor for theoretical physics at the Universität des Saarlandes (Saarbrücken, Germany) in 1999. His main research areas are: statistical physics and computational physics, in particular disordered and glassy systems, non-equilibrium dynamics, stochastic processes, complex systems, Monte Carlo simulations and combinatorial optimization.